What happened to the Cutlass(s)@ Wlater Soplata’s farm? J-46’s? He cannot possibly be unaware of the engine’s poor reliability and the reason the F7U’s were referred teas the “Gutless Cutlass?” The 4000psi hydraulic system was also notorious for a very low MTBF. I wish him a very great deal of luck in his effort. No, not unaware at all, however no other afterburning engine will fit the confines of the airframe allotted engine space, and no un-augmented engine that will fit will produce enough thrust to exceed the J46’s performance, as lackluster as it was. Therefore, the reliance on proper and diligent maintenance and inspection will have to carry the day. The J46, properly maintained, was equal to or exceeded expectations compared to contemporary “sized” engines of the day, however, these maintenance practices were often lacking in execution. Regarding the hydraulic system, it was the now-standard 3000 psi system, however the fitting and seal technology at the time was still designed around the then-standard 1500 psi. This will be corrected in the restoration to ensure reliability while retaining cosmetic accuracy . The F7U was the first fleet ready fighter to use this high-pressure system, and the hose and fitting technology of the day was not up to the task. Fortunately, this pressure is now common and the equipment is improved to handle the higher pressures. Thank you for your good wishes with the project, we can use every bit of support we can get!! Al, thanks for the reply and for the correction on the psi of the hydraulic system. I was relying on “What Chief told us,” and we all know Chief can’t be wrong, 😉 Sorry to hear that engineering-wise, the bays cant accommodate a more modern engine, ala the Me-262 project. But I certainly concur that with a very rigorous maintenance program, modern fittings, hoses, etc. for all systems, the MTBF for engines and other systems will be raised to a much higher, and therefore significantly safer, level. Plus, you’re not trying to bring her aboard! Look forward to hearing more, going ahead. I wonder if you’ve heard the same hangar talk that a number of years ago, a University Aero Engineering department’s student project “redid” the F7U with thin wing, modern engines, systems, etc, including FBW and showed that with modern technology, the F7U would be able to hold its own with at least F-16/F-18 peers? Indeed, in fact Vought re-engineered the Cutlass to utilize a single J57 in a new center-section fuselage, and pitched the idea to BuAer to retrofit the existing F7U’s, as well as continue with further production. The Navy balked, most likely due to the advent of higher performing fighters in the pipeline, namely Vought’s own F8U. Had the Navy not been beholden to Westinghouse in the late ’40’s and early ’50’s, the -3 would probably have been designed around the J57 earlier. With an insanely incredible roll rate, and prodigious power, the F7U could have been side by side with the F8 in Vietnam. But, history is what it is. I interviewed Jack Christensen many years ago, who was a BuAer rep pilot in Dallas and later took the F7U-3M on the boat with VX-4. His conclusion was that properly maintained, the Cutlass was no worse than any other jet of its day, and in fact was the most aerodynamically versatile aircraft he ever flew. He loved the aircraft and had very little bad things to say about it, but did yearn for more robust powerplants. Interestingly, with few exceptions, the majority of engine-related incidents/accidents were caused by hose material failures, or maintenance errors. Properly maintained, and carefully operated, the J46’s were as reliable as any in the day. I sure wish that this project was closer to my home, Arlington,Texas! 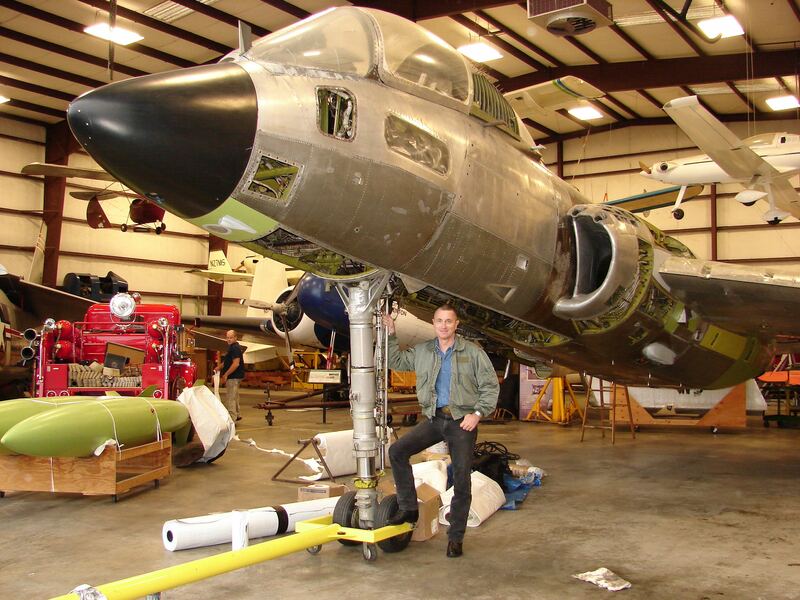 I’d love to help with this project,as my late father worked at Chance Vought on this program as well as with the F-8..He was a flight test mechanic and always spoke highly of the Cutlass..Wishing you the best! Thank you James! Did your father retain any photos from his time with the F7U’s? Al, I’ve been interested in this project for a long time as the Cutlass is a really neat plane and have always wished to see one in the air! It looks like that’s a bit closer now. Did it get to Arizona yet? I’ve seen a picture of it all wrapped up in what looks like a new hangar. You make an excellent point on reliability regarding the hydraulic system. The plane was a first on so many levels and as with most trailblazers, problems arise but the potential was definitely there. Too bad the bad press is mostly what it is remembered now. I hope by restoring it and displaying it you can dispel some of the myths as Delmar Benjamin did with the Gee Bee! Good luck and keep us posted! Josh, Thanks for the kind words and encouragement. I have transported the engines, ailevators, and a plethora of internals to Arizona in May, and will be bringing the afterburners, tailcone, outer wings, and canopy in October to begin work on those components while awaiting the bulk of the aircraft. We will detach the center-section wings hopefully late in the year and should have the aircraft in Phoenix next year. I utilized the remains of another F7U to effect “practice” wing removal and have tentatively decided that properly accomplished, no damage will be done to 554. This will simplify transport to the level of a very easy move, and also accommodate the absolute requirement to replace the upper wing surfaces due to delamination, as well as access the wing’s bladder fuel tanks for rebuild. In the meantime, we have been fabricating jigs and dollies for all major, and many minor components, and relocating to a larger facility to support the accommodation of the aircraft. Thanks again for your support!! I assume 544 is the aircraft that I saw at Paine Field in 1998 at the Seattle Museum of Flight’s restoration hanger. I had previously read the story about how it ended up there after being on a pedestal for years. There was a lot of corrosion on the wing panels in what looked to be balsa-cored magnesium. The weather had really taken a toll on the magnesium. Best of luck with your project. It is indeed a rare bird. 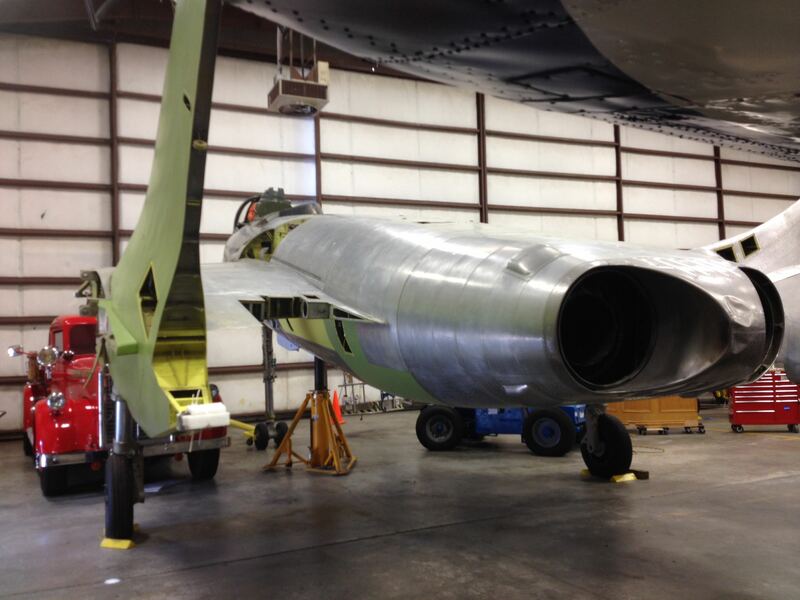 This is a really exciting restoration and I hope to see it fly some day. I saw a Cutlass at Moffett Field NAS when I was a kid. It looked cooler than cool. Still does and I am 68 now. I’ll be in touch, I have many photos from VF-124 and Project Cutlass, and would love to mutually assist one another. 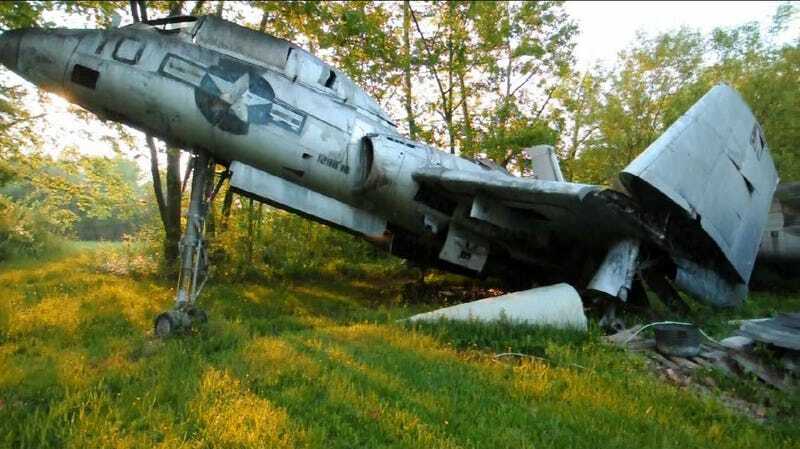 at Port Columbus by the Navy reserve building (also replaced by a F-86H) I just wondered if that’s the one that ended up at Walters.Thanks for the memories and best of luck !! I was afforded the opportunity to strip the Ft. Lauderdale F7U (BuNo 129582…..one of only three F7U’s to have been assigned to the Marines) back in 1983 when it sat at Ft. Lauderdale Executive Airport. The aircraft was slated to go to the Intrepid Museum, and I was given the green light to recover whatever I wanted from the internal areas of the aircraft, provided no external parts were removed or detached. Following two weeks of working around the clock, sleeping sporadically under the wing of the aircraft, and taking 22 hornet stings to the face (a whole adventure in itself! ), I finished up and took my crates of parts home. Unfortunately, the Intrepid decided that the aircraft was too much for them to move / restore and eventually declined to acquire it. They contacted NMNA who also declined the aircraft, and it was subsequently dismembered and taken to the Avon Park Bombing Range. It was eventually destroyed in live fire exercises. The front nose gear fairing door of 129582 was hanging by wire when I first arrived to begin work, and although technically it was an external piece, it really wasn’t “attached” per se (in my mind! )…….given the aircraft’s ultimate fate, I’ve enjoyed looking at that gear door in my office for the last 35 years….. Regarding Walter’s aircraft, it was an ex- VA-12 aircraft that was acquired from the NARTU at NAS South Weymouth, MA. The Columbus aircraft was subsequently scrapped. I learned about the sale/transfer from Tom and have wanted to stay up-to-date with your restoration. I know there must be others, but I’m in touch with 4 other former Cutlass pilots. Two of us were in both VF124 and VA126, two others were in VA126 and another flew the earlier models of the F7U at Patuxent River and later at TTU at Moffett Field. Those of us who spent a good deal of time in the Cutlass were well aware of its shortcomings but we still had a lot of positive things to say and were happy to have flown it. I look forward to the arrival of the F7U coming to the Midway Museum and to news of your progress. I’ve been meaning to contact you for some time, but as you can imagine, this project has me going in twelve directions at once! I’m going out of town to recover a Navy carrier deck APU and drag it across the country back to Phoenix, but upon my return, I hope I can begin a dialogue with you regarding your time with the F7U, your insights into flying her, and your experiences as maintenance officer for VF-124. Thank you so much for reaching out and nudging me out of my blinders. I look forward to the day when you can again see this particular Cutlass up close.